Alastair Cooke @DemitasseNZ is a consultant, writer, trainer, producer of the popular #vBrownBag TechTalks at VMworld, and famed creator of AutoLab, with AutoLab 3.0 just released featuring vSphere 6.7 support! He's also a New Zealander who has apparently flown to the bay area, presumably to Supermicro in San Jose, for quite the unboxing and vSAN configuration event! I just learned of this yesterday (thanks Ariel! ), and found the details moments ago. I figured my audience might want to check this out, published just in time to be included in my TinkerTry Weekly that subscribers get at 11pm ET on Wednesdays. Having just worked with a customer on configuring the BOM (Build Of Materials) for just such a 2U/4 node system last week for my day job, this nice surprise event couldn't be more timely. I help customers sift through the wide variety HCI solutions in the form of vSAN ReadyNodes and VxRail, and the more I know about the variety of HCI solution providers out there, the better! The only thing is that I'm in a NYC hotel overnight: good thing I just talked the front desk into a late checkout, I guess I'll find out how long I can watch until housekeeping kicks me out. Alastair is apparently with new-to-VMware industry veteran Keith Townsend @CTOAdvisor, which should make this an even more interesting, informative, and entertaining event. Our next challenge to Build Day Live is at Supermicro. We will be doing a datacenter install, looking at the product lines they offer, and configure VMWare VSAN on a BigTwin 2u chassis. 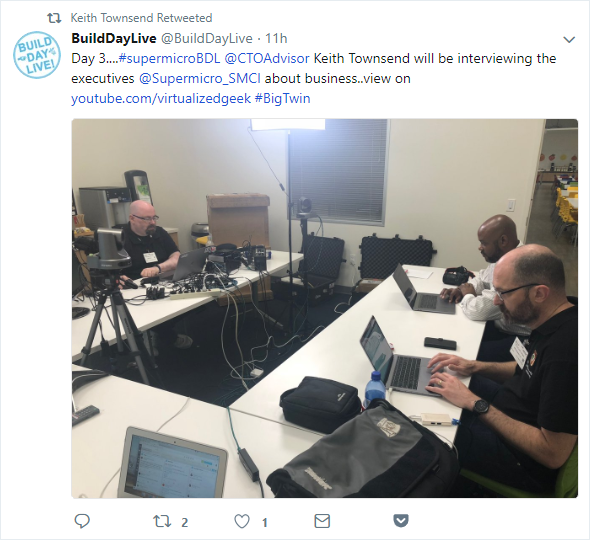 The Build Day Live at Supermicro was a lot of fun and we learned a lot about Supermicro as a company as well as their many products. All of the videos are now in the playlist on YouTube. As usual, there is a condensed version of the live stream as well as each of the pre-recorded segments that we made at Supermicro. Don't forget that Keith Townsend also has CTO Advisor videos with us here in his YouTube channel. 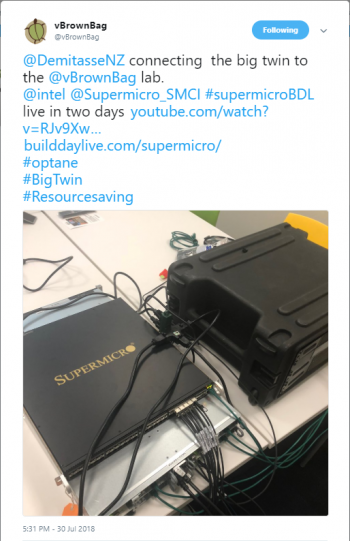 Anthony Hook has some thoughts about the Build Day Live at Supermicro and shared them in this blog post. The Gorilla Guide to the Build Day Live at Supermicro is well underway, I will let you know when it is available as an eBook and hopefully you will be able to pick up a printed copy from Supermicro at VMworld. 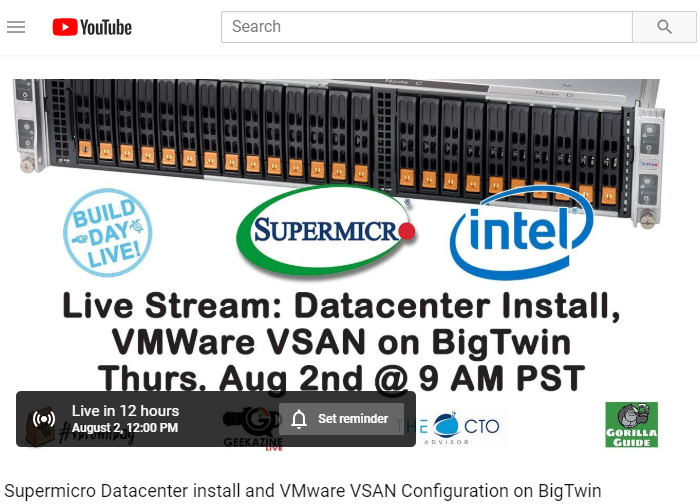 ... As a minimum, we will deploy VSAN onto a BigTwin. BigTwin is the four servers in a 2U appliance that we often see as a HyperConverged Infrastructure (HCI) appliance. I am very interested in how simple discrete servers and VSAN are to deploy compared with integrated HCI. Hopefully, we will have some Intel Optane drives for ridiculous performance. Maybe we will also be able to show off one of Supermicro’s new storage servers that can hold 32 NVMe drives, for even more storage performance. The third product that we may be able to play with is a GPU loaded server for Artificial Intelligence/Machine Learning (AI/ML) workloads. With all the AI/ML noise I would like to see a problem solved without months of work by Data Scientists.